It's very easy to book the usual haunts for celebrations, meritorious establishments where you know you will get an excellent meal with great service. Niall McKenna's and Michael Deane's offerings usually spring to mind and I was very very nearly in Love Fish knowing it is one of Rachel's favourites. However, with the goal of trying some of the city's lesser known eateries in the back of my mind I was determined to try somewhere new, somewhere where I hadn't heard any reports , good or bad, and somewhere with a bit of a buzz on a Saturday evening. I booked what can only be described as a bit of a hidden gem. Yugo, located down the side of the infamous Danske Bank on Donegall Sq West was the restaurant of choice to celebrate our 6th wedding anniversary. When booking I was informed that the only seats available were stools overlooking the kitchen, which was more than fine by me. I truly savor a restaurant with an open kitchen, even more so when there is an opportunity to watch chefs do their thing in close proximity. Upon being seated at the bar the friendly waitress presented us with the menu and wine list. Much to Rachel's approval, I have recently started to enjoy white wine in appreciating the complexities the paler wine of choice provides. I opted for an Australian Riesling which to my limited knowledge proved a hit. Menu wise it was divided into Snacks, Smalls, Bigs, Sides and Bao Buns. We ordered all the snacks with nothing jumping off the page in the starter sections. Tuna Sushi and two types of Dumplings. The Sushi, a Tuna Belly with Cucumber and Nori was everything that you want from great sushi. Well seasoned rice, fresh tuna (belly), wasabi and a slice of pickled ginger presented on top. The first dumpling was made with ground pork which was steamed and finished with a black vinegar dressing. The vinegar, very like Balsamic, was a surprise addition to the dumpling which provided an obvious acidity that not surprisingly complemented the ginger and spring onion. Rachels dish of the evening! The second was the same pork dumpling that was steamed then fried and finished with whole fried chillies, soy and garlic. I enjoyed the fried version better due to the addition of chilli and the crispy texture. 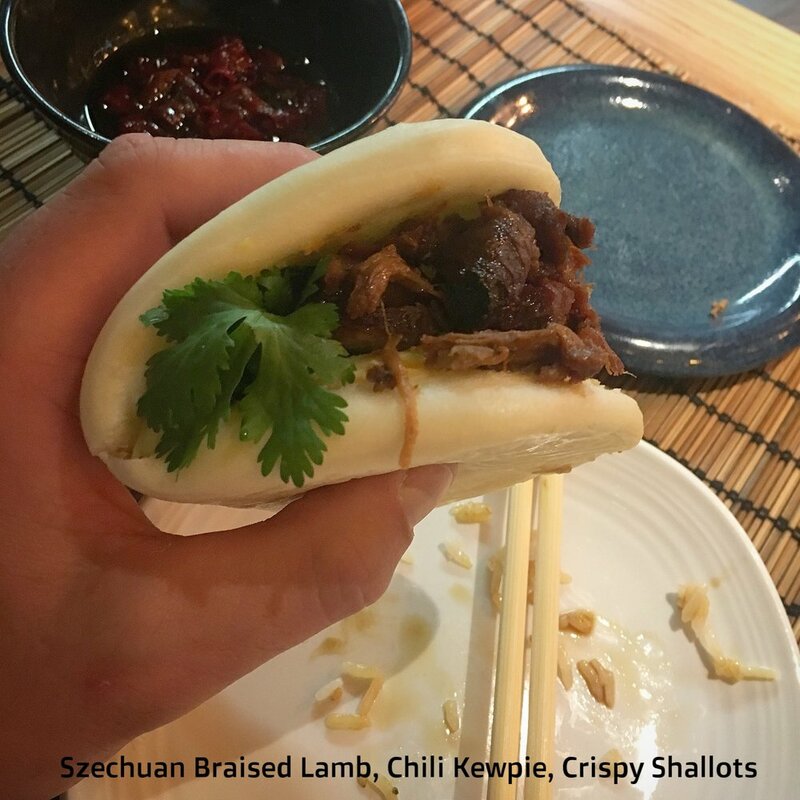 Next up were the fantastic Bao Buns, think Chinese style sandwiches. The buns are made from what seems like clouds that are steamed to order and filled with a range of meats and Japanese mayo, Kewpie. The first was a Szechuan braised lamb with chilli Kewpie and crispy shallots. From speaking with the chef, Gerard if I remember his name correctly, it was lamb shoulder that was perfectly tender with the chilli mayo adding a creaminess to the bao with the crispy shallots providing the crunch. Maybe my dish of the night. The second bao was a panko breaded prawn with a hint of sambal (Chilli based paste) again with a touch of Kewpie. The baos were so great you could easily visit for them alone alongside a couple of Chinese Beers. For mains, we went for the Massaman Chicken Curry and the Iberico Pork. The Massaman was the only slight let down of the meal. To me, a Massaman Curry is thick, rich and luxurious. This was more like a loose Thai Green Curry. However, the flavours were fragrant and fresh but slightly lacking in depth. If the lamb bao wasn't the night's favourite the second main of Iberico pork was. I was fairly impressed that the pork was served pink, something many chefs don't have the bravery to present. The tenderness of the pork was coupled with a rich soy-based dressing with a hint of sweetness. On the side was a pulled pork fritter that was moist on the inside and crispy on the outside. A bit of a delight that provided an excellent contrast to the loin. A shiitake and radish rounded off an excellent dish that I will definitely return for. For sides, I opted for wok-fired green beans with pork mince, something which I will try to make myself in future. The fat from the pork mince transformed the usually dreary green bean into something you actually want to eat. To sum up, Yugo has many great things going in its favour, most notably the head chef. Being sat at the kitchen we got an opportunity to chat to Gerrard at the end of service. Having been working in Melbourne for the past 12 years, which explains his fusion style of cooking, he talked a bit about his influences and how he compiled the menu. The waitresses had a friendly, relaxed manner in their service style which I found appealing. Price wise the bill came to £120 including tip. Not exactly cheap but with a decent bottle of wine, a few drinks and great food it is hard to complain. Zen has forever held the stylish Asian eatery crown in Belfast but it seems there is finally a worthy alternative in Yugo. P.S. 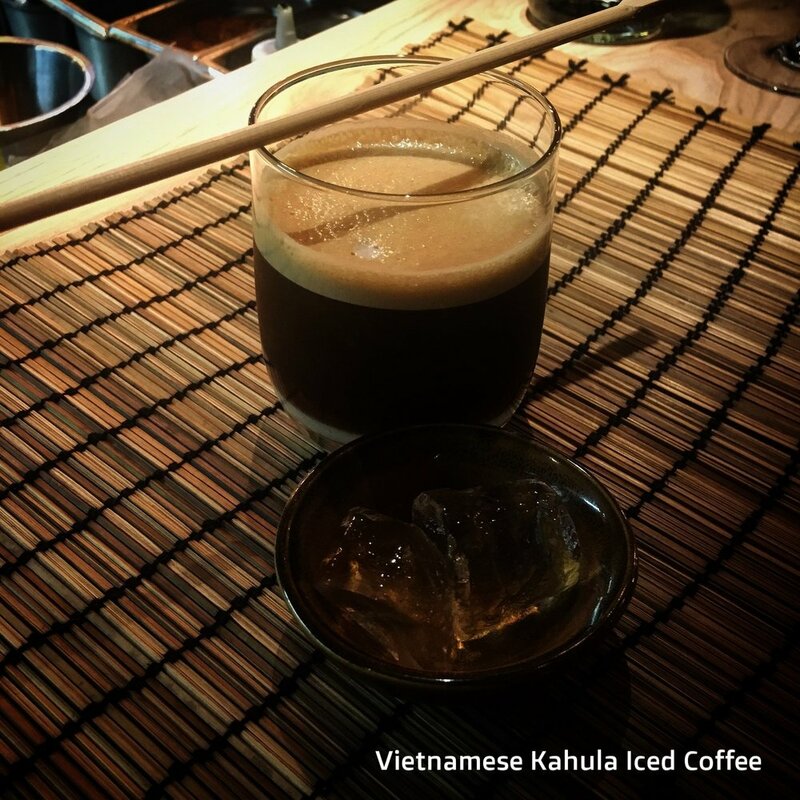 if you are a fan of coffee based cocktails be sure to try their Vietnamese Kahlua Coffee!